FCC Chairman Wheeler Names Admiral David Simpson PSHSB Chief: FCC Chairman Tom Wheeler announced his intention to name Rear Admiral David Simpson as Chief of the FCC’s Public Safety and Homeland Security Bureau (PSHSB). 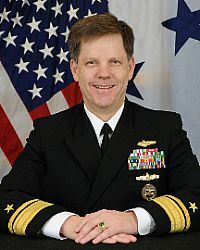 Admiral Simpson brings more than 20 years of Information and Communications Technology experience supporting the Department of Defense, working closely with other agencies to provide secure communication services and improve cyberdefense readiness. NPSTC Files with FCC on Emission Mask Requirements for Digital Technologies on 800 MHz NSPAC Channels; Analog FM Capability on Mutual Aid and Interoperability Channels. In its Notice of Proposed Rulemaking (NPRM) in this proceeding, the Commission proposes to require digital technologies to comply with Emission Mask H when operated in the 800 MHz National Public Safety Planning Advisory Committee (NPSPAC) band (806-809/851-854 MHz). The Commission also proposes to require equipment to have analog FM capability when operating on 800 MHz, VHF, and UHF public safety mutual aid and interoperability calling channels. Wireless Broadband Coalition Projects 700 % Hike in Mobile Data Traffic. A projected 700% hike in mobile data traffic in North America between 2013 and 2019 highlights the need for the U.S. government to make more spectrum available to carriers, according to the Wireless Broadband Coalition. The coalition cited a report released by Ericsson that projects a seven-fold increase in mobile data traffic in North America between this year and 2019. The increases are expected to be even greater – 11 times – in Latin America; Central Europe, the Middle East, and Africa; and the Asia Pacific regions. A projected 700% hike in mobile data traffic in North America between 2013 and 2019 highlights the need for the U.S. government to make more spectrum available to carriers, according to the Wireless Broadband Coalition. The coalition cited a report released by Ericsson that projects a seven-fold increase in mobile data traffic in North America between this year and 2019. The increases are expected to be even greater – 11 times – in Latin America; Central Europe, the Middle East, and Africa; and the Asia Pacific regions. “The data Ericsson has collected is compelling. For the third consecutive year, actual traffic on wireless networks has exceeded all the forecasts used by the FCC in developing the spectrum allocation recommendations in the 2010 National Broadband Plan. Despite continued advances in the deployment of new technology like LTE, more cleared, paired, spectrum below 3 GHz will be needed to help the wireless industry deliver the mobile broadband services that consumers demand,” David Taylor, executive director of the coalition, said in a statement released yesterday. When Tulsa firefighters respond to emergency calls in the near future, crews could be accompanied by unmanned drones. Members of the Tulsa Fire Department gathered Wednesday to watch a demonstration of how the unmanned aircraft can work in concert with first responders on the ground to save lives. “We want this to be another just another tool firefighters can use,” said Oklahoma State University clinical professor J.A. Kidd, whose students help setup and operate a drone for the rescue simulation. The drone was outfitted with a camera and software that enabled several first responders at the site and at a command post to gain access to real-time information related to the emergency, Kidd said. “Over the past 45 years I completed a military career and for the past 22 years have led some magnificent teams in developing technologies that have made a real difference for first responders. We created the Office of Science and Technology in the National Institute of Justice and had it written into law, and did the same with the Office of Interoperability and Compatibility. We built all but six of the 132 DNA laboratories in the United States, so there is now one or more in every state and territory. We initiated the National Commission on the Future of DNA Evidence that set the foundation for the use of DNA in this country. We developed the backscatter x-ray systems in use in our airports and strengthened the standards for airport metal detectors (sorry about those), changed the interoperability culture in the public safety community, and developed genuinely interoperable technologies – the multi-band radio, most of the patch systems in use, ROW-B (now at NORTHCOM) and the interoperability continuum adopted throughout the U.S. as well as by Canada, the UK, and Australia. We created the National Law Enforcement and Corrections Technology Center System, still supporting practitioners and created the nation’s largest corrections technology demonstration that still takes place every year. We completed the first successful cross-border, seamless, real time information exchanges (CAUSE II) with Canada and did it without making anyone buy new equipment or change applications or business processes. We created and made a national institution of the SAFECOM program, moved the P25 standards along, created the Common Alerting Protocol now in use everywhere, and defined data exchange protocol standards for emergency and law enforcement data. We initiated the first national interoperable information sharing system (Virtual USA), the first national alerting system (CMAS, now called WEA) that goes directly to modern digital devices (e.g., smart phones). We saved the body armor program at Justice, created the first national investigative guides (homicides, burglaries, arson, etc.) regularly referred to by the courts. We conducted the first study of the exoneration through DNA of persons who served years before the new technology could exonerate them, and we changed – through our studies of why convictions had gone wrong – how eyewitness evidence was collected, validated, and assessed. We conducted the study of pepper spray that confirmed its safety and protected its use by law enforcement, developed and commercialized COPLINK (now in use in just about every law enforcement agency in the country), and commercialized dozens of other technologies now in common use by first responders”. As you can see Dr. Boyd has lead many projects which have benefited not only Public Safety but also many other areas. He will be missed and I know that he will continue to follow our progress even from his well deserved retirement. I have learned a lot over the years from Dr. Boyd and wish him well. I hope to see many of you in Boulder next week for the PSCR meeting.